Idaho Viola Camp is a casual, musically satisfying camp for violists entering the 8th grade and older. Students and faculty all camp together at Ponderosa State Park in McCall, Idaho. Musical activities are held at McCall Congregational Church. Students participate in large and small viola ensembles, yoga, individual practice, an outdoor concert, and more. There are daily outdoor activities, including hikes, swimming, canoeing and campfires. Because of the unique nature of the camp, and of violists everywhere, Idaho Viola Camp provides a strong, supportive community, creating friendships that last a lifetime. The 2019 camp runs from August 4-10. More details about meeting times for carpools to McCall, where to check in, and final concert time and location will be announced as we get closer to camp. Generally, we leave Boise around 2PM on the 4th, and perform our concert in Boise at 2PM on the 10th. Campers are done around 4pm on the 10th. Scholarships are extremely limited. Please check with other resources (your school, family friends, etc) before asking for a scholarship to Viola Camp. Many faculty donate hours of their time and energy to making the camp happen, and every scholarship given out is subsidized by these hardworking individuals. You can pay your deposit or tuition here! Posted by idahoviolacamp on October 3, 2018 in Uncategorized. The 2018 camp runs from August 5-11. More details about meeting times for carpools to McCall, where to check in, and final concert time and location will be announced as we get closer to camp. Posted by idahoviolacamp on November 29, 2017 in Uncategorized. VIOLA CAMP 2017 is FULL! Check back on Nov 5, 2017 for registration for Camp 2018! The 2017 camp runs from August 6-12. More details about meeting times for carpools to McCall, where to check in, and final concert time and location will be announced as we get closer to camp. Posted by idahoviolacamp on September 9, 2016 in Uncategorized. The 2016 camp runs from August 7-13. More details about meeting times for carpools to McCall, where to check in, and final concert time and location will be announced as we get closer to camp. Posted by idahoviolacamp on August 9, 2015 in Uncategorized. The McCall camp is FULL. Please send an email to boiseviola8@gmail.com to get on the waiting list. There are still spots open for Boise Day Camp. The 2015 camp runs from August 2-8. More details about meeting times for carpools to McCall, where to check in, and final concert time and location will be announced as we get closer to camp. Posted by idahoviolacamp on August 9, 2014 in Uncategorized. Welcome to Day 3 at Viola Camp! The students are working very hard on their music, and learning a lot about different musical styles and techniques. We celebrated our college intern’s birthday yesterday. A former viola camper herself, Ann is a valuable asset to the Viola Camp team. Happy birthday! Campers are looking forward to our adventure to Gold Fork Hot Springs tonight. Posted by idahoviolacamp on August 6, 2014 in Uncategorized. We are having a great time here at Viola Camp! Campers have made new friends, connected with old friends and started the process of making beautiful music together. After a slow drive up to McCall, campers set up camp, ate dinner and went for their first rehearsal together. Today, we will rehearse, have game and craft time, practice time, go for a hike, have a campfire, and more! Our final concert is at 2pm Saturday, August 9 at The Summit Church in Boise. Come support the viola campers! Posted by idahoviolacamp on August 4, 2014 in Uncategorized. The 2014 camp runs from August 3-9. More details about meeting times for carpools to McCall, where to check in, and final concert time and location will be announced as we get closer to camp. Posted by idahoviolacamp on November 10, 2013 in Uncategorized. 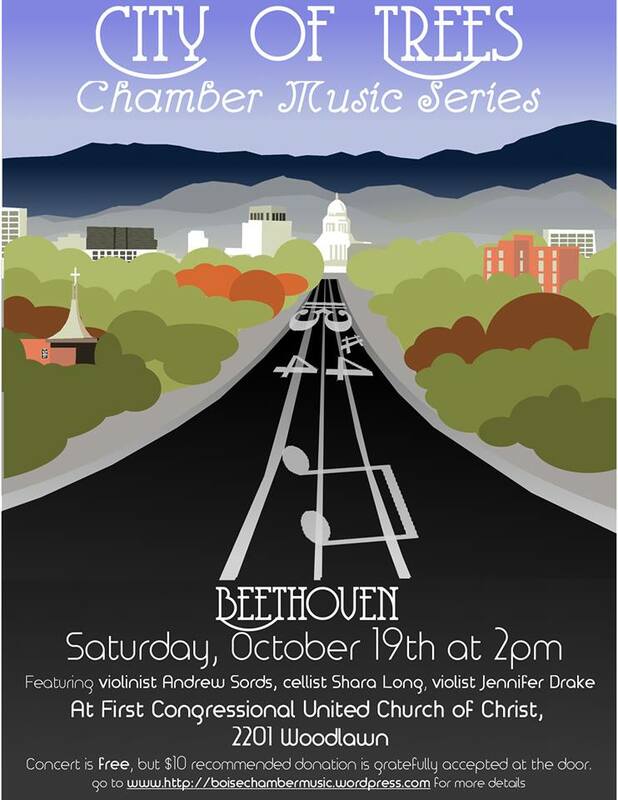 Our upcoming concert “Beethoven!” features special guest artist Andrew Sords performing with cellist Shara Long and violist Jennifer Drake. They will play Beethoven’s C Minor String Trio. We look forward to seeing you there! Posted by idahoviolacamp on October 15, 2013 in Uncategorized. Posted by idahoviolacamp on August 12, 2013 in Uncategorized.